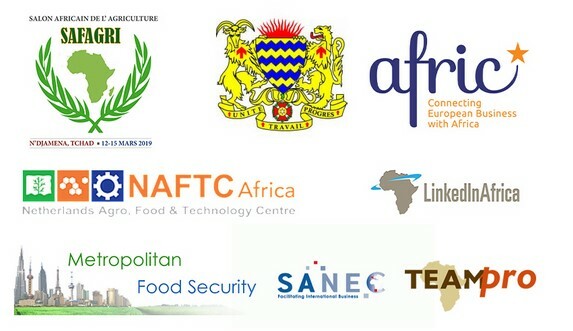 The (SAFAGRI) AFRICAN TRADE FAIR OF AGRICULTURE is a tool and a showcase of Exchanges on continental and intercontinental level in the agro and technology sector. To create a framework of exchanges and of experience sharing among stakeholders. Connect the different stakeholders of food chain action in primairy production, of processing and of marketing for the purpose of reinforcing integration and contributing to the smooth flow value chain development and trade exchanges. Contribute to reduce barriers for regional transactions. Exhibit agricultural products and technologies to show potentials that our countries have. Contribute to improve human health by encouraging consumption of health processed local products. ICDCS member states: Benin, Burkina Faso, Cape- Verde, Ivory Coast, the Gambia, Guinea, Bissau Guinea, Mali, Mauritania, Niger, Senegal, Chad, Togo, those of ECOWAS, of WAEMU and Europe, Netherlands, France, Germany as well as other regions (Israel). Open to large attendance, the trade fair will welcome all stakeholders directly involved in agriculture, horticulture, aquaculture, forestry, stock breeding and halieutic industries. There are companies, organizations, Associations; administrations and institutions. The trade fair will constitute a platform of agriculture, food, forestry, stock breeding and halieutic products and food processing. At the end of a contest, rewards will be attributed to outstanding stakeholders for the impact of their actions in favor of Agricultural development. The local press and national organs of represented countries will provide coverage of this first ever agri-food fair in Chad. SAFAGRI is an opportunity of meeting between : Suppliers of all kinds of equipment and services, farmers, industrialists, researchers, financiers, professionals, political, decision-makers, responsible of administrations, project managers, civil society, etc. Join them to build up and develop your own network. To develop your projects, to seek for clients and suppliers. Organize meetings between professionals and create a framework to generate added value. Familiarize the attendant with products from abroad. Moreover: to associate one’s image with this big rally, open up a field of visibility over the African continent. They are destined for professionals, political decision makers, company managers, financiers and bankers, farmers. The future magazine program document will be subject of a large distribution in all the African agricultural networks. On website, it will be handed to every visitor. The cost for participation in our collective Holland Pavilion is €550 or an individual boot €765, excluding VAT, travel and accommodation. Including: matchmaking sessions at the fair, plenary sessions, networking events, local assistance from Afric, NAFTC and the Fair organization. We have made agreements with Radisson Blu, Hilton and Ledgers hotel for you, please consult us for your reservation. Afric connects European companies with the great economic opportunities that Africa offers, in particular Chad. Afric promotes trade in Africa by providing European companies the tools they need to succeed in various regions and different markets across the Continent. By organising numerous events throughout the year, Afric offers its customers and associates a valuable networking opportunities that solidify ”new B2B and B2G relationships”. 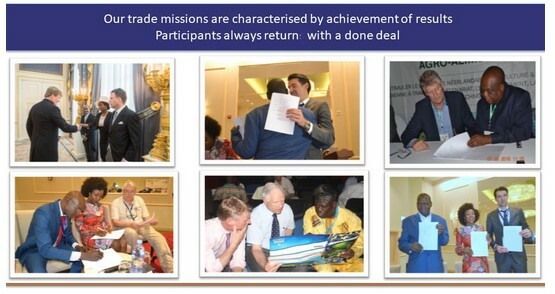 The Annual Trade Mission on Agro-Industry in Chad is a fine example of this. In addition, Afric organises seminars, workshops, communication sessions and financial services for its customers, as well as opportunities enabling them to converge on this principal objective: ”Doing business in Africa”. At Afric, we are always ready to meet your needs and to connect African and in particular Chadian business opportunities with Europe, by providing the best tools and services. Participants always return with a done deal!